ABAP executive director Ed Picson said yesterday Fil-Brit boxer John Marvin, a late discovery from out of the blue, might just pull a surprise to win the gold medal in the lightheavyweight division at the coming SEA Games in Malaysia. Marvin, 24, is a British lance corporal with the 1st battalion of the Princess of Wales regiment based in Germany. His father John, Sr. is a retired professional singer, former cruise director and now a yacht master. His Filipina mother is Teresita Tupas from Pampanga. His younger brother Jonathan, 22, is with the merchant navy. As a boy, Marvin used to make regular visits to the Philippines with his family. But before this trip, he hadn’t been back in 11 years. Marvin said he expects his parents to be at ringside in K.L. 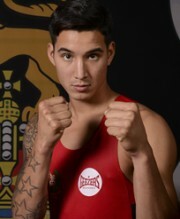 Marvin learned how to box when he was seven and joined the Ventnor Club under coach Darren Green at the Isle of Wight. When he joined the Army, Marvin signed up for the boxing team and it led to winning the middleweight and cruiserweight titles in combined military services tournaments. He’s been with the British Army boxing team for five years.